Import of textured 3D-models in the popular Autodesk® FBX- and Collada (Sketchup) DAE-format. In the ground sketch, placed exhibits are represented as icons. Here, new exhibits can quickly be distributed over several rooms as a preliminary placement. The model view imitates handcrafted architecture models. Exhibits can be placed across larger wall sections. The model view is particulary well suited to visualize room proportions in an overview. The 3D view shows the virtual museum from a first-person-perspective. This view is as close as possible to the visual situation planned for the real exhibition. Wall colouring and exhibit distances can best be checked in this view. Choosing frames and passe partouts here is a good choice, too. With the secondary click or right click, you can open the wall colour dialogue. Here, either RAL, Pantone or RGB colours can be used to select the wall or floor colour of your choice. It is possible to put the same colour to a single wall, to all walls of the current room or to the whole exhibition architecture, including the floors, too, if needed. With a right (or secondary) click on the measurement button, distances between exhibit wall limits are displayed. The distances are updated dynamically, i.e. if you add or move an exhibit, distances change accordingly. Furthermore, the distances shown are the source for the dimensioned wall developments. The third button available via secondary click engages pdf export of dimensioned wall developments as vector graphics. All data necessary to “install” the works in the real world exhibition are included in the pdf. The pdf can be saved at a location of your choice and is scalable without loss (except for the exhibit images). This is particularly useful for large printouts. You can add custom text comments near the placements on demand. 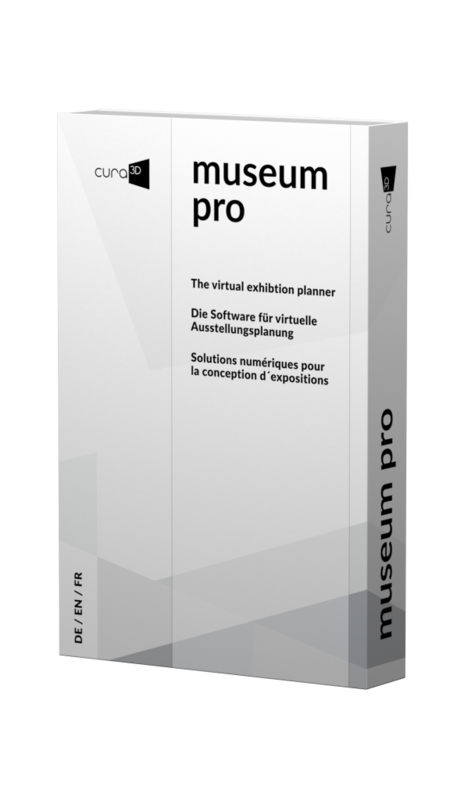 cura3D museum pro’s exhibit configurator can help you to quickly visualize your frame and passe partout choice. A frame library is at your disposition where each frame can be scaled freely. Frame widths, heights and depths can be supplied arbitrarily, so you can choose passe partout measures. Frame and passe partout colours can be defined either in RGB or based on the frame library. In addition, we can predefine a set of standard frame sizes available at your gallery or museum. Passe partout sizes are then adapted based on exhibit and frame sizes. 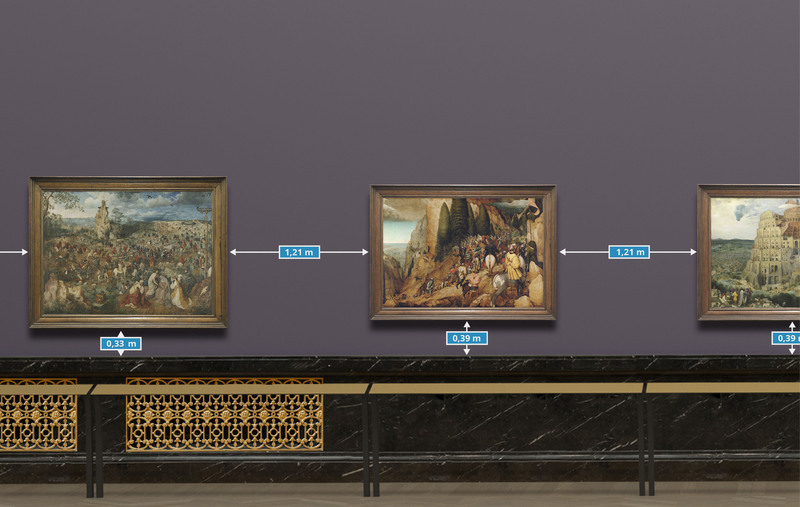 In order to quickly integrate rarely used rooms into virtual exhibition planning, cura3D museum pro also offers a module for creating custom rooms. Based on floor plans, users can create simple rooms and use them for planning. The visual quality meets the requirements for the reliable assessment of room proportions and basic color moods. Especially for exhibition halls exhibiting their exhibits in foreign spaces, too, this means a considerable gain in planning security. We are happy to provide you with a free demo version. Just write us a short message or contact us by phone.We are happy to provide you with a free demo version. Just write us a short message or contact us by phone. If you would like to be kept up to date on the latest developments at cura3D, you can subscribe to our newsletter here.